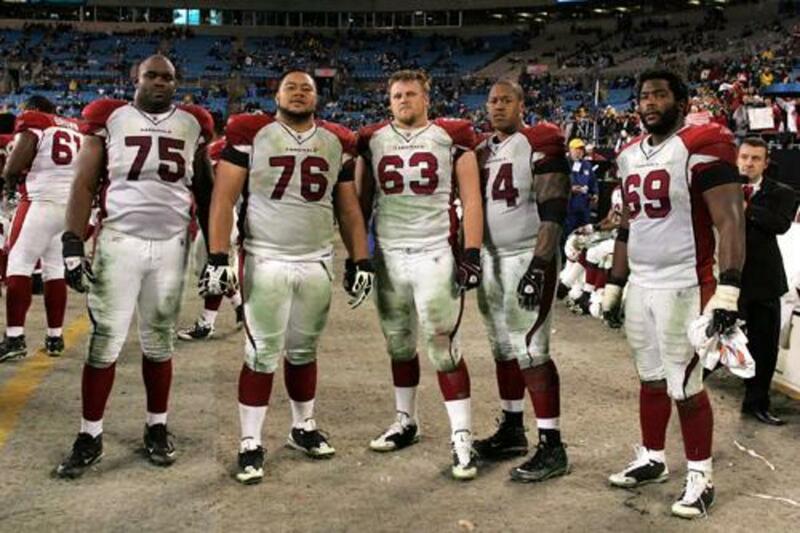 You think you have what it takes to play offensive line on an American football team? You'll toil in obscurity, leave the field bruised and bloody every day, and the only time the announcer will say your name is when you commit a penalty. While your teammates are throwing the ball and running around in the grass in the summer, you'll spend endless hours in the weight room pushing iron. It's a thankless job, and there is little glory for the offensive line, but make no mistake: Your work can make or break your team, and your devotion to your position will be noticed by the people who matter. A good line will make a mediocre halfback look like a superstar, but a good halfback can't do much by himself. No team wins without a strong offensive line. If you have the guts to play center, guard, or tackle read on. 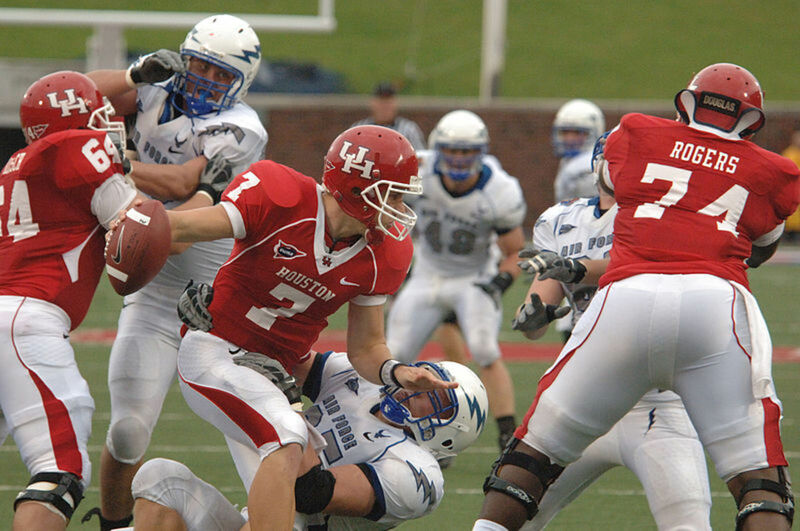 This article will get you started on the basics of playing on the offensive line. So, what does it take to be an offensive lineman? While football players come in all shapes and sizes, here are the key attributes shared by most good linemen. If you ever get a chance to look at a college football roster from the 1940s or so, you'll notice offensive tackles weighing 220 pounds were common. By the 1980s, a man weighing 260 pounds could still make it as a guard in the NFL. These days, 300 pounds is the standard for professional and college offensive linemen. Of course there are some players who are much bigger, but few who are smaller can make it to a high level these days. On a high-school level size is still important, but significantly smaller players can be successful, especially at guard or center. While larger players may do better, a young man weighing as little as 180 pounds can do well if he has the necessary strength and toughness. As much as size is stressed by coaches, it's important for high school athletes (and their coaches) to be realistic about their potential, and aware of the damage they could possibly cause by gaining too much weight. Obesity is a serious issue, and it's important to consider a player's health when their football days are done. Offensive linemen spend a lot of time lifting weights, as their primary job is moving other players out of the way. It is not uncommon for professional and elite college players to bench press 500 pounds or more. A 300-pound bench press is a good goal for high school linemen. Young players should concentrate on heavy, basic lifts to build strength and gain muscular body weight. Bench presses, squats, deadlifts, military presses and power cleans are all important lifts for linemen. The focus of the lifting program in the off-season should be on building strength, power and muscular body weight, while the in-season program should focus on injury prevention and the maintenance of strength. NFL and college players have the benefit of a dedicated strength and conditioning coach with an NSCA CSCS credential to guide their training program. Many high school players have that too these days, but if you don't then it's up to you to learn all you can about strength training and figure out how to train. Don't rely on bodybuilding magazines or fad programs to get strong. Spend your time on basic lifts that will make you a better athlete. Find a coach or trainer who can advise you along your way, and educate you on the proper way to lift. Offensive linemen do not need to be especially fast in a 100-yard dash, but they do need to be quick in distances under 20 yards. Depending on the style of offense your team runs, as a guard you may be required to run almost as much as the running backs on your team. Offensive linemen need to be able to stay ahead of the backs they are blocking for, at least for a short time. Training should include short sprints of 40 yards and under, as well as shuttle runs. Practice running short sprints from a three-point stance, both vertically downfield, and laterally as though you are pulling. You don't need to be faster than your running backs; you just need to get to the point of attack before they do. Big, strong linemen who are slow don't get the job done. Good offensive linemen also hustle. When a play goes by them they do not quit, and they do not stop and walk. They chase the play and try to catch up to the action. You never know when you might recover a fumble, have a chance to make a key block on a cutback or otherwise be in position to make a play. Never give up! All football players are tough, but offensive linemen have a different kind of toughness. There is certain camaraderie among linemen, a code that says they are going to stick their head into the play and give it their all, no matter what. 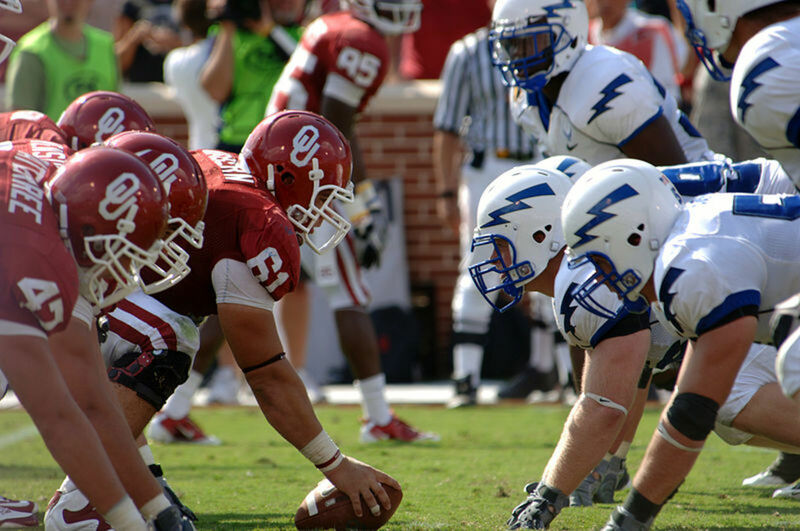 While football is a team game, offensive linemen often play a one-on-one game within the game. A tackle against a defensive end. A guard against a defensive tackle. A center against a nose tackle. These rivalries can last a game, a season, or a career. You may look forward to seeing a certain opposing defensive player all off-season, paste their number in your locker and think about them every second while you are training. When you finally play them, you know you're going to measure yourself by your performance in this grudge match. This kind of warrior pride is what separates the offensive line from most other offensive positions. Linemen must be tough enough physically to get the job done. But they must be tough mentally as well. A tackle must understand that even though he may have been beaten for a sack, he needs to show up the next play to protect his quarterback. A guard needs to understand that even though the man across the line may be bigger and stronger than him, his grit and attention to fundamentals can win the day if he hangs in there. Now you know what it takes physically and mentally to make it as an offensive lineman. Are you still in? Here are some key football terms you need to know. Note: If your coach uses some words or terms you don't understand, it is important you ask him to explain as soon as possible. There is nothing wrong with asking, and your coach would rather take the time to explain than have you make a mistake in a game. It's also important that you respect your coach by following his advice, even if it is contrary to something you read here or anywhere else. Pull: Pulling is a technique where a lineman breaks laterally down the line of scrimmage and blocks someone besides the player who lined up across from him. A good example of this is on sweep plays, where offensive linemen lead the play ahead of the running back. Guards pull more often, but tackles and even centers may pull on certain plays. Trap: A trap play is where a defensive player is set up to believe he is left unblocked, and then gets knocked out of the play by a lineman he wasn't expecting. In reality, smart defensive players usually know when a trap is coming, but if it is executed well it can still be effective. As in a pull, the linemen breaks laterally along the line of scrimmage and finds the player he is supposed to trap. Guards trap most often, but tackles and centers may do so as well. Fold Block: Instead of blocking the defensive player directly in front of him, a linemen may run around the back of his fellow lineman and allow that player to crash down and block his man. He will then "fold" around the block and take the player his teammate would have blocked. 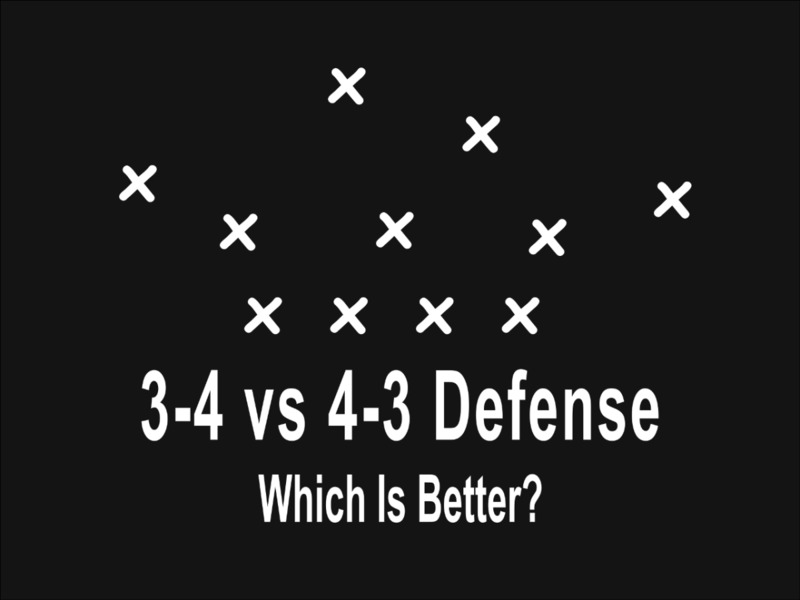 This is most often done when the defense shifts so that the original blocking scheme at the point of attack is made too difficult. Reach block: This is one of the toughest blocks in football. Sometimes a lineman may be forced to block a player who is lined up in a strong position for stopping the play. This requires the lineman to reach, or quickly get into position to make the block at the snap of the ball. It's a tough assignment, but good linemen have a way of getting it done. Base blocking: All linemen block the defensive player lined up directly in front of them. This is generally most useful when the offense runs quick-hitting plays like dives. Base-blocking is the technique all players learn in youth football, though at the time they do not call it that. 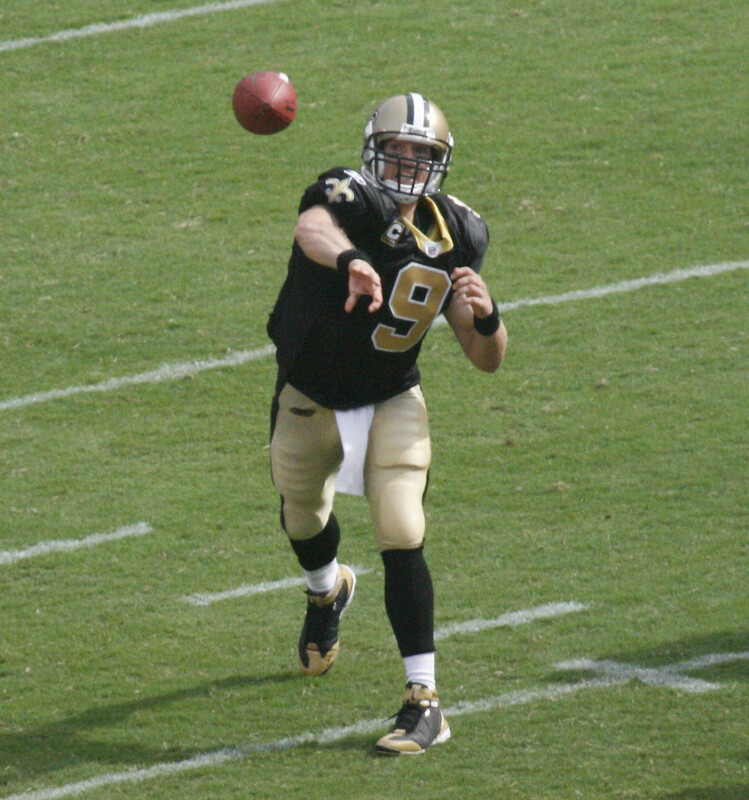 Pass blocking: Obviously pass blocking occurs on passing plays, but there is a specific technique to it. Most passing plays start with a jab step, followed by giving ground for a step or two. It is important for linemen to be aware of any stunts and blitzes that the defense may be attempting and compensate. 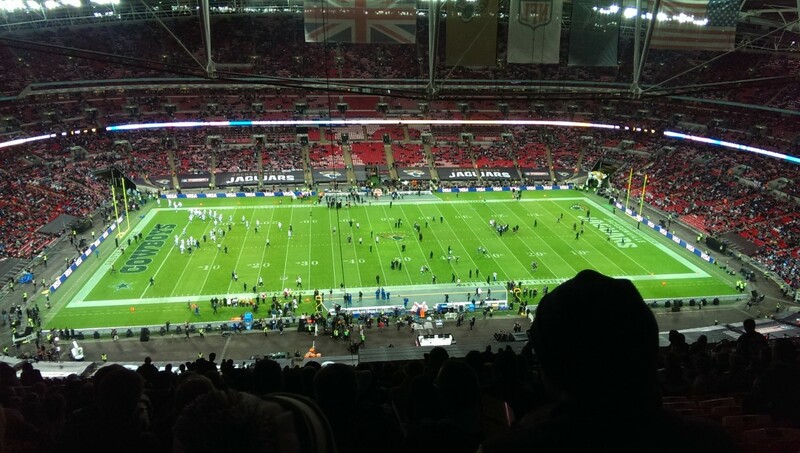 Blitz pickup is a significant part of the passing game, and involves the coordination of the offensive line, the quarterback, the tight ends and the running backs. 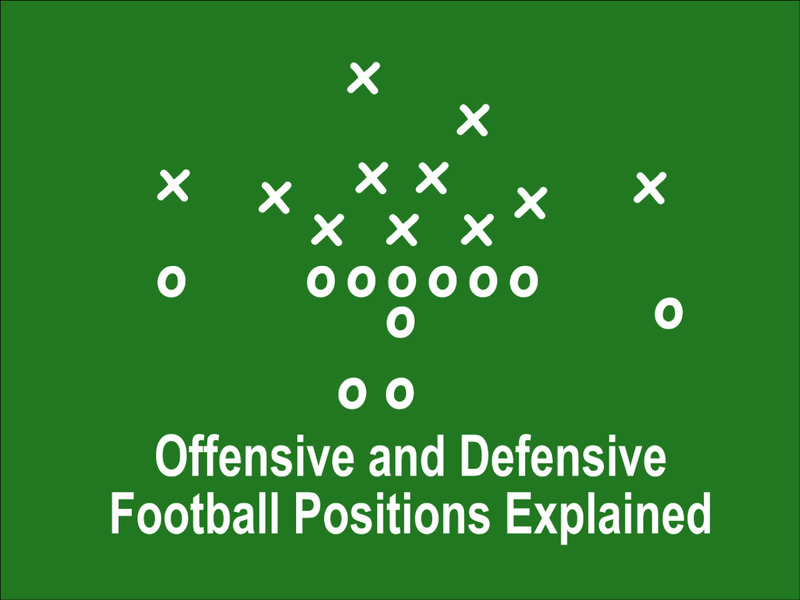 When they talk about skill positions in football, they are usually talking about every offensive position except the lineman. This is a little unfair. Blocking is definitely a skill, and while the action in the trenches sometimes looks like a bunch of guys mindlessly smashing into each other there is much more to it. Good blocking technique means keeping your head up and seeing what you are hitting. Hit with your shoulder, never with your head. Stay low, and drive with your legs. 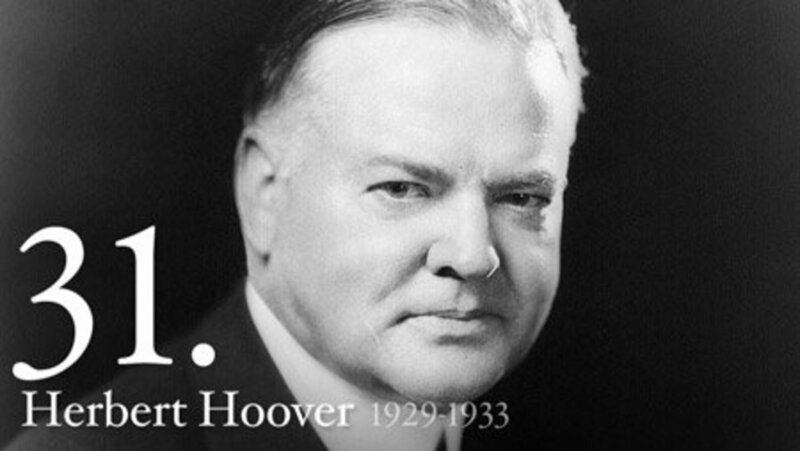 Play to the whistle, and keep on driving until the play is over. Sound simple? Maybe, but for good blockers it's an art form. You may not grab an opposing player's jersey or any other part of him. You may not use your hands outside of shoulder-pad width to steer or impede an opposing player. You may extend your arms and push a player who is directly in front of you. You may not reach out and hook a player who is to the side of you in an attempt to move him in front of you. You may not push a player from behind under most circumstances. You may push a player from behind if you were already in continuous legal contact with him when he turned around. You may use your hands to deflect the hands and grasp of a defensive player, as long as you are not grabbing him in return. If you watch a high-level offensive lineman work you'll notice his technique is a combination of good footwork, driving with the hips and legs, and winning the upper-body war with his arm and chest strength. People wonder why bench presses are so important to football players, and this is why. Much of the battling is done by pushing and shoving players who are directly in front of you. If you understand everything you've read in this article you are well on your way to becoming a good offensive lineman. You're going to hit the weights hard, work on your blocking technique and be ready for the mental and physical battles that occur in the trenches. What can you do to stand out from the crowd? The answer, in a nutshell, is to be a great athlete, not just a great lineman. You can assume all of the offensive linemen in your league are going to be doing the basics necessary to get strong and hit hard, but how many of them will have quick feet, great endurance and outstanding agility? Big, strong linemen are a dime a dozen, but you can stand out from the crowd by upping your conditioning level. Skip rope to improve your coordination and agility. Work with a speed bag to improve your hand quickness. Use a balance board to improve your base, so you don't get knocked off your feet by that super-quick defensive end. Spend time on your cardiovascular conditioning in the summer so you don't bonk when you are needed late in a close game. These are the extra things you can do to stand out from the other good linemen in your league, and they may even earn you a scholarship. Because, even though quarterbacks and running backs get the glory, the linemen do the grunt work, and the people who matter notice. One of those people who matter may be a college scout. What Does It Take to Be a Great Lineman? Which do you think is the most important attribute of an offensive lineman? All of the the above!